Dan Barker of the Freedom from Religion Foundation seems like a heckuva nice guy. Unlike so many of the obstreperous atheists on the Web, he is intelligent, respectful and polite. But I am only basing this on a couple of interviews on Christian radio shows that I heard. Still, he does not have a reputation for being nasty. The first one I heard was with Matt Slick of CARM. An attempt to schedule a debate had fallen through, so Dan was a guest in the studio with Matt. There was no specific agenda or topic. To listen to that, click here, but do not click on the "listen now" button. Instead, use the link "Carm_Podcast_2-7" to get the MP3. Also, Matt had a show where he discussed a debate he had with Barker a few years earlier, that show is here. When hearing this show, I had feelings similar to those that Matt expressed, how so much was touched upon and a week of one-hour shows could stem from it. Barker had numerous instances of bad reasoning, word games, philosophical excuses and bad theology, so several visits would have been quite interesting. After this, Dan Barker was on "Stand Up for the Truth" prior to a debate with Dr. Jerry Bergman of the Genesis Foundation. This was more formal, and they discussed not only his justifications for atheism, but how the Freedom from Religion Foundation conducts itself. You can listen/download here. Barker was caught in some glaring inconsistencies. Mike LeMay pointed out some of those in an article. 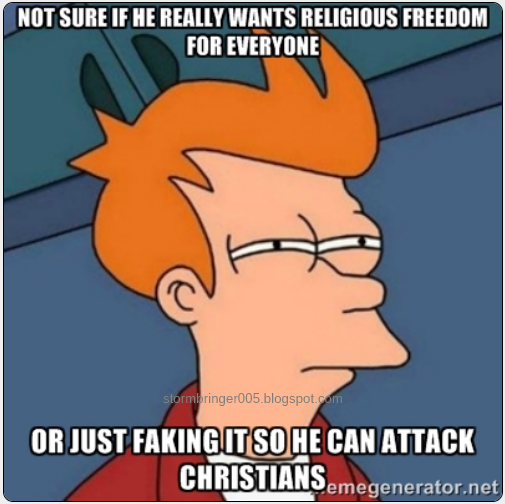 One thing that I don't think anyone caught was how he claimed to be for everyone's religious freedom, but when Obamacare violates religious freedom, there's not a peep from FFRF. Double standard much? But the SUFT team does not let Christians off the hook because bad theology and lack of commitment (and understanding) on the part of Christian teachers that helps give us people like Dar Barker. Somewhat related is the next interview on "Stand Up for the Truth", where Dr. Bergman is interviewed about the religion of secular humanism, Barker and other related topics. You can listen/download the Dr. Bergman discussion here.